(Rocky Run Nature Area - 01) This sign is posted at the entrance to the Rocky Run Nature Trail, the easiest way of traversing the Nature Area. We made this excursion while we were attending the North American Vegetarian Society's Summerfest in August 2003. (Rocky Run Nature Area - 01a) This is a closer look at the map of the nature trails. 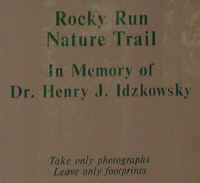 (Rocky Run Nature Area - 01b) This is a closer look at the dedication on the entrance sign. (Rocky Run Nature Area - 02) The early morning fog drifted across the Joe-Pye Weed that was growing along the side of a pond. 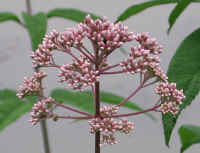 (Rocky Run Nature Area - 03) These are some of the ways of identifying Joe-Pye Weed: their height of from 2 to 7 feet, their purplish colored stems, and the way the leaves grow in a whorl of four to seven leaves. 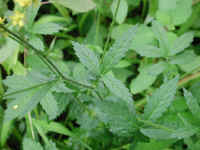 This plant has five leaves in each whorl. 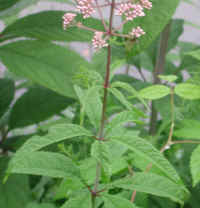 (Rocky Run Nature Area - 04) During the time of our visit, the flowers of the Joe-Pye Weed were still in their bud stage. 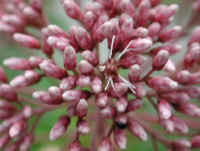 (Rocky Run Nature Area - 05) One Joe-Pye Weed flower was just beginning to open. (Rocky Run Nature Area - 06) This is another look at the dome-shaped flowering cyme of the Joe-Pye Weed. (Rocky Run Nature Area - 07) In this photo, we're looking at the still waters of the pond behind the patch of Joe-Pye Weed. (Rocky Run Nature Area - 07a) The flower clusters that make up the dome-shaped cyme of the Joe-Pye Weed branch off the terminal end of the stem in whorls, in the same way as the leaves. 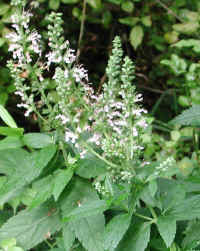 (Rocky Run Nature Area - 07b) This Joe-Pye Weed has six leaves in each of its whorls. 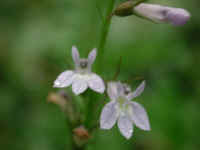 (Rocky Run Nature Area - 08) Wet with the morning dew, small wild flowers sparkle like gems amidst the grasses and other plants. 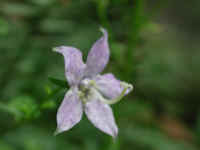 (Rocky Run Nature Area - 09) This is a closer look at one of these wildflower gems. (Rocky Run Nature Area - 10) The mistiness of the blended colors of wildflowers and background add to the drama of the morning. 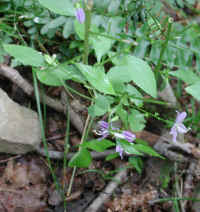 (Rocky Run Nature Area - 11) We could not specifically identify this wildflower species, but it has the general characteristics of a lobelia. 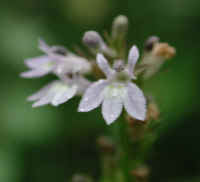 (Rocky Run Nature Area - 12) More dew-covered lobelia buds and flowers. 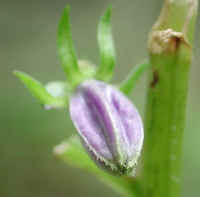 (Rocky Run Nature Area - 13) This is a bee's eye view of a lobelia bud that is nearly ready to open. 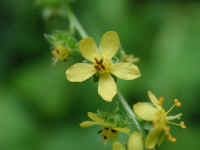 (Rocky Run Nature Area - 14) We were not able to identify these trailing yellow wildflowers that we spotted along the side of the path. (Rocky Run Nature Area - 15) We took this photo of the leaves and hairy stems in the hope of being able to identify this wildflower afterwards, but as of the date of this publication, we still hadn't identified it. (Rocky Run Nature Area - 16) This is a closer look at some of the flowers that are growing from the hairy stem. (Rocky Run Nature Area - 17) This is another look at the flowers growing along the stem. 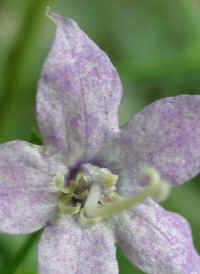 (Rocky Run Nature Area - 17a) While processing this photo, we realized that we had photographed what appear to be unusual growths on the underside of the flower's sepals, but realized, from looking at the next photo, that they are really part of the flower's calyx. 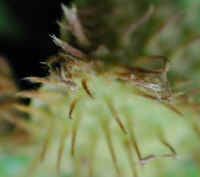 (Rocky Run Nature Area - 18) The bud on the right has the "growths" we discussed previously. However, we still don't know what they are. 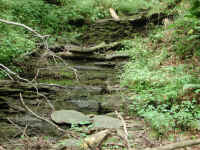 (Rocky Run Nature Area - 19) The pathway meandered along the hillsides as it descended into the valley. The sides of the path were lined with all kinds of interesting plants. 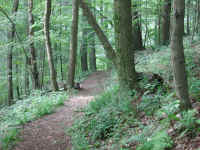 (Rocky Run Nature Area - 20) The pathway meandered along the hillsides as it descended into the valley. The sides of the path were lined with all kinds of interesting plants. (Rocky Run Nature Area - 21) Shortly after starting down the path, we spotted these wildflowers, which we were unable to identify. 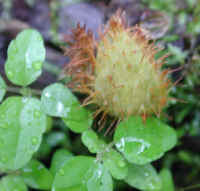 (Rocky Run Nature Area - 22) One of the things we found very interesting about this wildflower were its unusual looking flower buds. 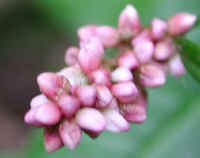 We had thought these buds would make it fairly easy to identify, but so far its identity has eluded us. 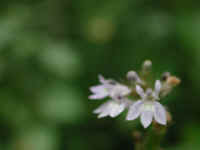 (Rocky Run Nature Area - 23) We thought the mottled bluish colored corolla with five petals would also help in the identification of this wildflower. 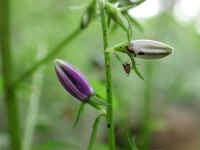 (Rocky Run Nature Area - 24) This is another look at this wildflower with its long pistil. 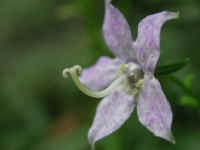 (Rocky Run Nature Area - 25) Here is another close-up of this wildflower with its mottled petals. (Rocky Run Nature Area - 25a) In this bee's eye view of this wildflower we have an excellent view of the central curly structures (stamens?) 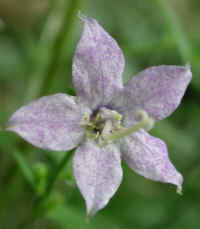 and the mottled petals. 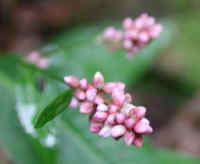 (Rocky Run Nature Area - 26) In this photo we have another look at the flower buds, one of which is nearly white. 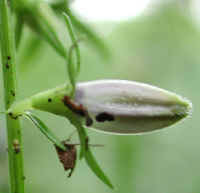 (Rocky Run Nature Area - 26a) This is a close-up of the whitish colored bud. (Rocky Run Nature Area - 27) A little farther down the path, we spotted what we believe is a species of smartweed. (Rocky Run Nature Area - 28) This is a closer look at the raceme of the smartweed. (Rocky Run Nature Area - 29) This is another look at the smartweed raceme. 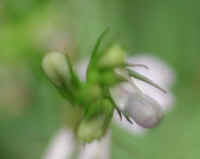 (Rocky Run Nature Area - 29a) In this photo we have a bee's eye view of some of the 1/8 inch long smartweed flowers. 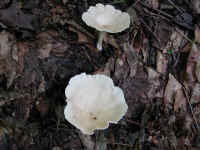 (Rocky Run Nature Area - 30) As we continued our walk along the pathway, we spotted these relatively rare and possibly endangered Indian Pipe wildflowers. 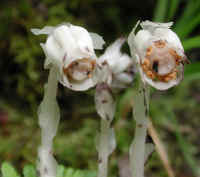 (Rocky Run Nature Area - 30a) One of the interesting features of the the Indian Pipe is that the plant lacks chlorophyll and derives its nutrition from mycorhiza, tiny fungi that are associated with the roots of the plant. 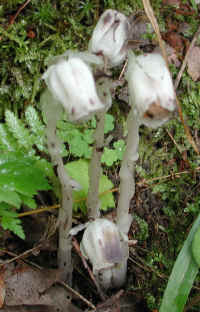 Indian Pipe plants stand 4 to 10 inches tall. 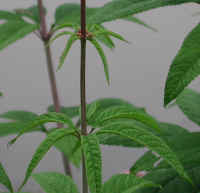 In this photo, we can also see the small scale-like leaves on the stems. 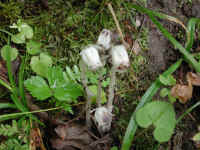 (Rocky Run Nature Area - 31) This is another look at the Indian Pipe's 3/4 inch long flowers. 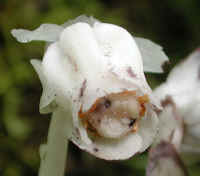 This pale, very delicate wildflower feels cool and clammy and very quickly turns black and decays when touched, characteristics which gave rise to its other name, Corpse Plant. 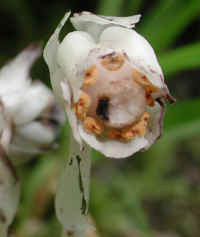 (Rocky Run Nature Area - 31a) In this close up photo of an Indian pipe flower we can see the five petals that form the bowl of the pipe. 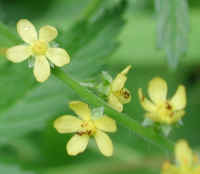 Sometimes these flowers have only four petals. 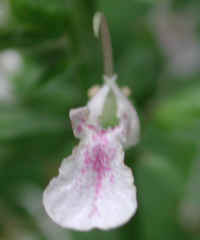 The curled white structures that are at the base of the bowl are the sepals. 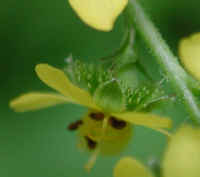 (Rocky Run Nature Area - 31b) In this close up photo we can distinguish nearly all of the ten stamens that surround the solitary central pistil. 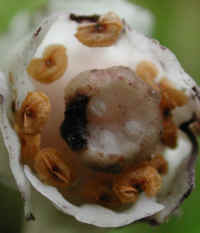 (Rocky Run Nature Area - 32) This is a bee's eye view of the pistil and stamens of the Indian Pipe. (Rocky Run Nature Area - 33) At a sharp turn in the trail, there was a semi-dry drainage course that had many interesting things to look at, such as the moss-covered rocks in this photo. (Rocky Run Nature Area - 34) We found several kinds of lichen like these that were growing on an interestingly sculptured rock. (Rocky Run Nature Area - 35) This is another photo of the lichen on the rocks to the side of the drainage course. (Rocky Run Nature Area - 36) We believe that these interesting looking lichens are a species of Cladonia, of which there are 128 known species in North America. (Rocky Run Nature Area - 36a) These Cladonia look like little castle towers. These erect stalks are called podetia. (Rocky Run Nature Area - 37) These Cladonia look like little castle towers. These erect stalks are called podetia. (Rocky Run Nature Area - 38) This is another look at some of the Cladonia that were growing on the rocks along the side of the drainage course. 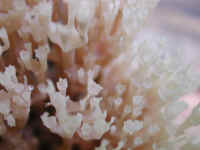 (Rocky Run Nature Area - 38a) This photo gives us a closer look at some of the Cladonia. (Rocky Run Nature Area - 39) This is another patch of Cladonia. (Rocky Run Nature Area - 39a) The podetia (stalks) of the Cladonia grow from edges of the thallus, or flat portion of the lichen that is on the surface of the rock. (Rocky Run Nature Area - 40) Moss and fungus clung to the moist rocks along the drainage course. 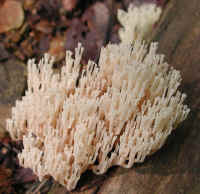 (Rocky Run Nature Area - 40a) This is a closer look at one of the fungus plants that were growing from the side of the rock. 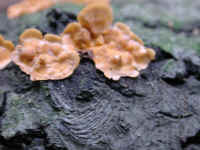 (Rocky Run Nature Area - 41) We took this photo from a lower angle so we could see the underside of the fungus and the way its growth radiates out from the attachment point on the rock. 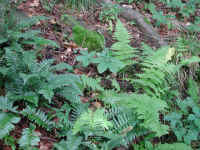 (Rocky Run Nature Area - 42) We spotted an unusual looking object on the ground next to some green leaves. 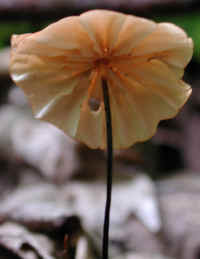 It appeared to be a seed pod. (Rocky Run Nature Area - 43) This is a close-up of some of the spines on the seed pod. 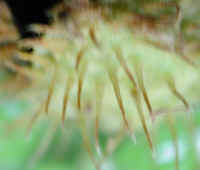 (Rocky Run Nature Area - 44) This is another close-up look at the spiny growths on the seed pod. (Rocky Run Nature Area - 45) A little farther down the trail we spotted this mushroom. 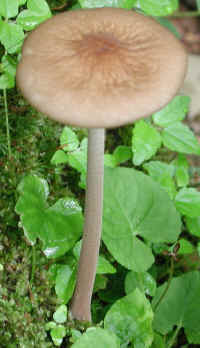 (Rocky Run Nature Area - 45a) In this photo, we have a closer look at this tall-stemmed mushroom. 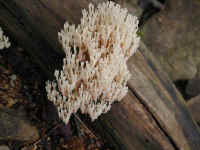 (Rocky Run Nature Area - 46) Then we spotted this delicate little mushroom that neither of us could ever recall seeing previously. This is one of the joys of our many nature walks. There are so many things in God's creation to see that there is always a sense of joy and excitement. 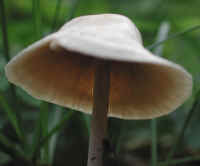 (Rocky Run Nature Area - 47) This is a close up look at the underside of this delicate little mushroom with its long slender stem. 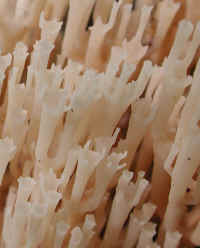 (Rocky Run Nature Area - 48) This is a close up look at the underside of this delicate little mushroom with its long slender stem. 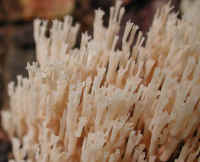 (Rocky Run Nature Area - 49) This is a look at the underside of the mushroom and its stem. 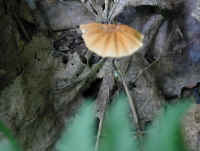 (Rocky Run Nature Area - 50) By shadowing this mushroom, we were able to get the camera to brighten the image of the underside. 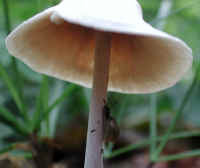 (Rocky Run Nature Area - 50a) This is a close up look at a portion of the mushroom stem and a visiting snail. 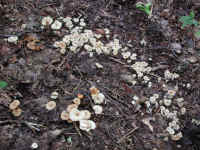 (Rocky Run Nature Area - 51) Then we spotted these cup-shaped mushrooms. 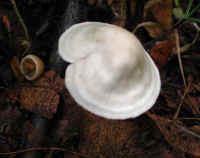 (Rocky Run Nature Area - 52) This is a side view of one of these cup-shaped mushrooms. (Rocky Run Nature Area - 53) In this photo, we're looking down into the "cup" of the mushroom. 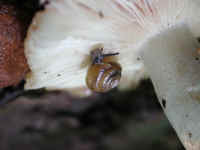 (Rocky Run Nature Area - 54) On the underside of this mushroom, we spotted another one of these small snails. 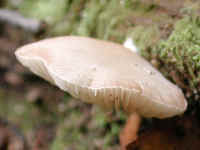 (Rocky Run Nature Area - 55) This is another view of the snail on the underside of this mushroom cap. 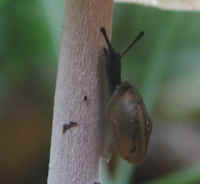 (Rocky Run Nature Area - 56) Science fiction writers refer to "encounters of the third kind," an expression used to describe meetings with beings of another world; however, we have encounters with other beings almost every day right here on earth, among them is our friend snail. 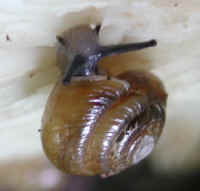 (Rocky Run Nature Area - 56a) This is a close up look at our little friend snail. 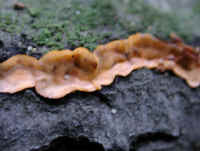 (Rocky Run Nature Area - 57) Even though this photo was slightly out of focus, we wanted to save it because of the red coloration of this mushroom. 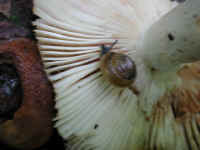 (Rocky Run Nature Area - 58) This is another mushroom with a visiting snail. Before we took these photos, we never thought about snails eating mushrooms. (Rocky Run Nature Area - 59) As we continued our excursion, we spotted these wildflowers which we were not able to identify. (Rocky Run Nature Area - 59a) In this photo, we have a closer look at some of the flower plumes and leaves. (Rocky Run Nature Area - 60) These are some of the flowers on one of the racemes. (Rocky Run Nature Area - 61) This is a bee's eye view of one of the flowers. (Rocky Run Nature Area - 62) This is a portion of the trail we followed on our climb to the top of the hill. 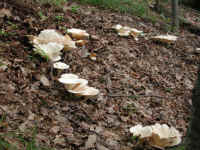 (Rocky Run Nature Area - 63) Near the top of the hill, we saw this patch of mushrooms. (Rocky Run Nature Area - 64) We thought that the way these mushrooms grew in a semi-circle would make an interesting photo. 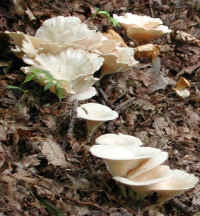 (Rocky Run Nature Area - 64a) This is a closer look at some of these mushrooms. After we took this photo, we went back to clean up, have lunch, and deliver a lecture. In all, we had a very enjoyable morning.